The question often comes up if we allow duck boats on our wetlands and lakes for waterfowl hunting. The answer is yes. And, there is a “but” with that answer. Access to most of our waterfowl hunting properties by vehicle is difficult. We do not allow heavy boats with motors on trailers since there is no ramp access. Getting stuck would be unavoidable. Some find this a disadvantage while other have sold their heavy duck hunting rigs opting for the Association’s easier to hunt with less work blinds. Those that do hunt from boats do so with what is commonly referred to as layout boats. These boats are not necessarily big water capable as wetlands do not generate layout boat threatening waves. We will suffer from winds, however our wetlands are certainly safer than coastal flyways waters. We allow small layout boats like the one above to hunt both ducks and geese on our managed wetlands, lakes and ponds. They would be most beneficial on our large open water wetlands like the one in the background of the photo. Since layout boats are usually about 10 to 12 feet in length, they can be transported on the top of a SUV, the back of a pickup truck or a small trailer. If the ground is muddy we allow the use of ATV’s to haul or drag gear to and from our wetlands. 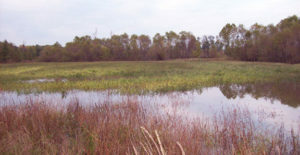 Our wetlands and lakes all have dams and spillways that control the depth of the water. The water is never moving, except by the force of the wind. If a hunter ever encounters moving water, this means the nearest creek or river is out of its bank and the water is rising. We do not allow hunters to hunt from layout boats while the river is at flood stage. Also, we do not support the use of layout boats on the creeks and rivers that border our wetlands. The banks are too steep to drop a boat in or drag one out. Each year we drain a number of our wetlands and shooting pools. We either let them grow to natural vegetation or plant to milo, corn or Japanese millet. Many of these are on wetlands without permanent blinds. We refer to these as wade-in areas. Wade-in areas are for those that do not want to hunt out of permanent blinds. 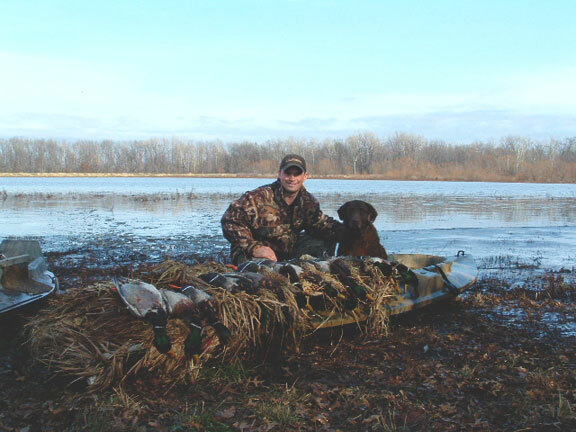 Layout boat blinds are encouraged to hunt from our wade-in areas like the one below with flooded Japanese millet. 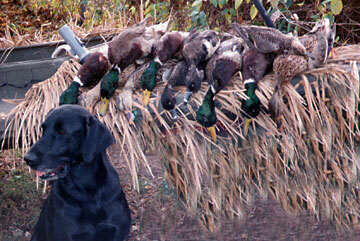 A low profile boat blind set up in flooded feed is ideal. Late season hunting for both ducks and geese consistently produces some of our best waterfowl hunting. Most hunters are not willing to break ice when the weather drops below freezing. Access by vehicle improves when the ground freezes. The weight of layout boats is a great way to open a shooting pool once the water freezes. Two late season limits taken from layout blind boats. 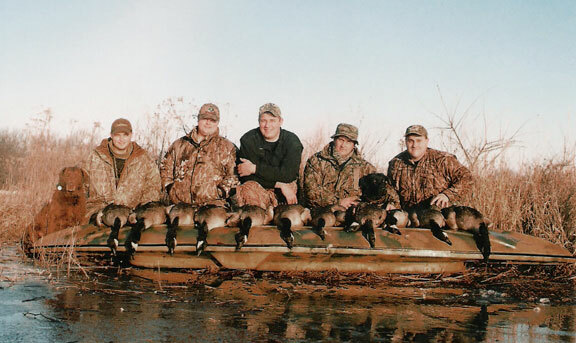 The bottom line with all of this whether talking about layout boats, layout blinds, the Association’s permanent blinds, field hunt s and so on is as a self guided waterfowl hunter organization all may hunt by their own methods. That is the advantage to all that have found themselves in the routine of one type of waterfowl equipment set. Most that have the heavier boats and large spreads soon find through this Association that going lighter means less work time compared to actual duck hunting time.